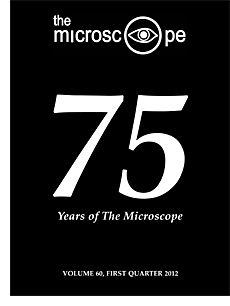 On the cover: The Microscope marks its 75th anniversary in 2012. Since the first issue rolled off the press in 1937, it has been published continuously, first in Great Britain and then in the United States. See the Editorial, 75 Years of the Microscope, by Gary J. Laughlin. Originally published in The Microscope, Vol. 30, No. 2, 1982.